Never could we ever of imagined on that joy-filled Wednesday evening that a year later our little baby would be diagnosed with cancer and four years later God would take him to heaven. Our little James blessed all of our lives and so, so many others more in four years than most do in a lifetime. No one has ever touched our lives and hearts more. James brought us all so much joy, happiness, warmth, laughter, and love. James taught us what it meant to love unconditionally, to laugh when it was hard, to see the little things, to value each moment, to have a deep compassion and mercy for others, especially suffering children. James taught us true bravery and courage! The kind only heroes can have. James never complained or asked why. He humbles us daily not to complain or to feel deserving of this life. Our James showed us Christ and brought the cross closer to our hearts. He taught us to lean on God and God alone. And he is still teaching us. James our precious son was a wonderful brother, both big and younger. James taught Paul and Brittney how to love without getting anything in return but a big smile. James taught them that they were to love and friend all even little ones with no hair. He gave all of them so many laughs and he allowed them to protect and baby him. It was always so sweet to watch them fight over who could show James more. And sweet little Mikey got to chase after James for a time. James adored Mikey. He was so proud to be a big brother. Our James molded and shaped all of us. James taught us what it meant to be willing to lay your life down for another. Something we prayed to do for James daily. James our sweet son taught us to long for heaven. Through a million daily tears we have ached to hold you in our arms, look into your big brown eyes, hear your sweet voice and have our hearts filled with your bright smile. God broke our hearts the day he took you from us. We miss you more than words can say and we long for the day we will be together again. We honor you in every way James! The weak need God. The strong need God. The difference between the two is significant. The weak have no choice but to seek God. It is all they have. The strong have a choice: seek God or rely on self. The weak do not have a choice; they cannot stand on their own. The strong do not need the weak because they themselves do not need them. So, where is the value in the weak individual? What is the value in the sick and suffering? Do they have value? Why does God have the weak with the strong? How can the strong benefit from the weak? The weak are valuable to God. They are valuable to the strong. James Matthew Greenleaf is our third child. Our son relapsed to his cancer the week of Valentines’ 1999. At least that is when we received the call from his doctor that confirmed the sinking feeling we had been having. He had been in remission for less than two years. It is not as optimistic this time. We try to be but there is a deep feeling of despair that lies beneath the surface. When he was first diagnosed it knocks you off your feet but you learn that there is so much that the doctors can do. There is optimism. You meet survivors. The medical staff aggressively fights against the beast of cancer. They have a lot of weapons these days. And the weapons fight the beast but it takes a toll on the little one year old that is not aware that a beast lies within warring against him. A heavy war wages for the next year with many battles and losses and wins and then there is peace. It is conquered. But we do not know if it is over. There were so many little cells to fight and kill. The good with the bad. But some may hide away. Some of the bad cells may hide away and wait. January 1999 we notice a limp in James’ walk. He is now three and without cause he limps. In 1996 a lump appeared on his temple without any cause. His left eye is droopy. No one knew. We notice the limp and we are defeated. A sinking feeling is there. A dark shadow from the past. We end a working vacation and return home early to his doctor. We get the call the week of Valentines. It hits you hard like when someone hits you in the stomach and knocks all the breath out of you. But it’s inside you. It is deep. He is still here. He is running, jumping and playing even in spite of his limp. He has thick blonde hair. He has energy. He seems healthy. ‘His name is James. His blonde hair bounces as he trots along playing in the summer breeze. His fair complexion and hair give a radiance in the glow of the sun. Energy abounds in this young boy and his smile lights all those around. He is also given the names of kindness and gentleness. Joy is what he gives back. His mother, the one I love, calls the studio photographer. We want photos of him and Mikey, his younger brother, before he loses his hair. The morning of our appointment it starts to fall out. We get great photos that afternoon. What a cherished treasure to have. The next day I take him for a buzz cut. This is a better alternative than thinning hair. He is proud of his new look. We are separated. I become a single parent. Terri, my wife and mother to our children, stays with James while in the hospital. She is the one I love. I am responsible for Paul Jr., Brittney, and little Mikey. We are not separated and I am not a single parent but it feels like it. We are disconnected in so many ways. It is lonely. She brightens our home. It’s not the same when she is not here. Their hospital stays are three to five days. Sometimes a full week. It is a cloud in my head. I cannot remember how we did it. I know there were caring hands watching over each of us. Mikey was well cared for. A typical day would be to get them ready for school. Get them to school. Drop off Mikey. Go to work. Pick up the kids from school or find out where they are and get them, pick up Mikey, and pick up a prepared meal from the endless caring hands that made them. What a gift it is to have loving hands that took the time to make sure a meal is ready for us. I hate it. I hate it because of why I am receiving it. It means that my son is sick. That the one I love is away. I would trade these meals for that. Praise God if your family never has meals prepared for you. But I am so humbled by their acts of love. It is the hand of God reaching out to us. Head home. Feed them. Bathe them. Homework. Bed. The next day the same. The one I love coordinates everything. It is a daunting task. She never stops. She is strong in the midst of her weakness. This seems at odds but that is the best description. We are surrounded and supported by amazing people who are the fingers of the hand of God. They pick us up and carry us. His doctor, his play lady, and the nurses bring strength and support. We are abundantly blessed despite the curse of cancer. A relapse to his cancer is not good. This is constantly before us. There is uncertainty. There is a toll on our son. He is sick. He is weak. We are connected to his suffering. But in the midst of it we see his joy, his hope, his love. Especially his mother. She is tied to James so much more intimately. She fights for him and hides her tears and heartache. She gives him her best. It comes at a cost. The price will be paid later. For now she gives her all. We are preparing him for Duke University Medical Center. They have one of the best facilities and staff in the country. We will be one of the lucky ones to be able to come here. Patients from all over the world come here for treatment. But this is all so overwhelming. There is that underlying pit in your stomach that is so consuming. You don’t have time to deal with it today. Sometime you will have the time. It hurts. The kids’ school year is nearly over. We have been to Duke. The plans are in place. We will move to Duke in the middle of June. This is summer. Families are going on summer vacation. We are packing for a small apartment where we will stay for the summer. Plans are made for Paul and Brittney to spend time in Florida and Charlotte. They will spend limited time with us in Durham. Everything comes at a cost and with a price. This seems the best plan of action. The plans are set. It is Thursday evening. The van and trailer is packed. It is our last evening before we leave. Paul, Brittney, James, and I head for the movies. We are in a hurry. Before we leave I close the trailer door. I swing the latch to secure the door and it slams heavy against my thumb. Within a week my thumbnail is black. It will remain like this until we return from Duke in August. We watch Star Wars Episode I. Brittney is insecure. She wants to go home. It’s not the movie. She says it’s the movie but it’s not. It is what she feels. She does not know how to express it. She senses the turmoil and uncertainty of the present and the future. It has been a lot to process what has happened since Valentines. How do you express the insecurity of all that is happening? The movie is great. James loved it. Especially JarJar Binks. Friday morning we head to his local hospital in Charlotte. The life care specialist, we call the “play lady”, has prepared a birthday party for him. It’s a month early but we know he won’t be back by his birthday in July. It is his best day of his life. We leave from there and head to Duke. We meet with the doctors Friday afternoon to discuss the details of the following week. We have the weekend to prepare and settle in. He will receive two rounds of radiation a day starting Monday and ending Friday. What a toll on the body. His mother takes him to these treatments while I stay with the other three. But one time I take him. I take him Wednesday morning. It is different when you are the one. It’s surreal. I hold him in my arms. They sedate him. They put ‘magic milk’ in his central venous line and I watch him pass out in my arms. It is not natural. It is disturbing. The nurse takes him and carries him into the radiation room. There are red warning signs all around stating the danger of radiation. The nurse and radiologist lay him on the table and then evacuate the area. He is bombarded at specific areas on his body and then full body radiation. He seems to me a sacrificial lamb being offered up in the hopes of a new life. He comes to and after fifteen minutes we leave. It’s hard to see the after effects. I can see he feels awful. But there are no complaints from him. He will go back to the apartment and lay around. He lies on the floor and tries to play but he is not up to it. In a few hours he will go for his next round of radiation. Yesterday he was playing and hurt his arm. Today there is a bruise. The bruise will never heal. The gravity of what you see gives you a pit in your stomach that gets deeper all the time. You don’t have time to deal with it today. Some time you will have time but that will be later. It hurts. Friday only one radiation treatment. It is treatment number nine. It’s his last day as outpatient. Friday afternoon he is admitted to Duke University Medical Center. We are assigned to the 5200 wing of the medical center. It is a specialized area for pediatric cancer patients. It has two double sets of doors to pass through. There is a wash area in between to wash up before going through the second set of doors. They have a specialized filtration system here. Each room is separate. Each door is closed. Immune systems are greatly compromised so a sterile environment is a necessity. We are in room 5201. The room is bare. It is sterile. We will fill the walls with cards and banners and pictures from the loving hands that made them from friends from church and Sunday school and from Paul and Brittney’s school. It is the wallpaper in his room. It becomes a bright room filled with personality and color. A nasty round of chemo for the next three days. It is lethal. It has to be. It has to kill all the cancer cells to be effective. But it also kills all the good life giving cells. The goal is to kill the cells without killing the patient. It’s a fine line. If you don’t kill enough then the cancer returns. If you kill too much the patient dies. The variables and risks are overwhelming. The aftermath is horrendous. The impact is severe. The recovery is slow. The high dose radiation and high dose chemo is a small part of his treatment and recovery. The actual transplant is effortless. It is like a blood transfusion. It’s the aftermath that is so severe. The body reacts to it violently. It is offensive and defensive. Alone death would come quickly. But modern technology, medicine, monitoring, and doctor knowledge and experience all contribute to a battle for life. Only time will tell. It is too much to take in and process. It is too much. But you don’t have time to take it in and deal with it. Some other time. There is so much to do. It hurts. Recovery? You don’t rest. There is no time for it. There is no peace. You are on edge always. It is a 24 hour watch each day. There are no breaks. But we are fortunate. Both of us as parents are here. We have support of each other. It is our home church in coordinated effort with a local church that allows us this. There are many here at Duke who come as single parents. We get time away from the hospital. It’s really not a break because you are exhausted and overcome and your head and heart are back at the hospital. Your thoughts do not rest. There is constant activity. So many pumps to feed into his central venous life line. A continuous cocktail of pharmaceuticals run through his body system. So many factors and variables to manipulate and respond to. It is a changing dynamic. Act and react. He is monitored 24 hours a day. We watch and are present always. Things can change almost instantly. Sometimes we as parents see things that the nurses and doctors miss. We are actively involved in his recovery. It is consuming. And we meet the others on the unit. There is Brian who is nineteen. He is so kind to James and us as we enter the 5200 wing. He offers courage and strength to his new young friend and we as parents draw from it. We do not meet all the kids on the unit. Chris is next door to us. He is too sick to come out. He is hampered by dialysis. I get a glimpse of him a couple of times when his door is open. He is a teenager. He likes to play football. It’s just him and his mom from New York. We see all ages of kids here. Some look so sick. It is overwhelming and consuming. The nurses and doctors are medicine to us. The nurses are the caregivers. They are the nuts and bolts of the operation. The doctors are the gods of the unit. We wait for their reports. The less we see them the better. This means things are going as anticipated. When the doctor is showing up more frequently we know that it is getting serious. It’s always serious but there are degrees to ‘how serious’. The first week is a blur. It was so intense. One of the chemo treatments has a side affect that affects the skin. We give him several sponge baths everyday to cleanse the skin from the burning excretions. The chemo also wreaks havoc on the digestive system. From the front end to the back end. His mouth and throat are raw. There are sores. You can tell he hurts and suffers. He doesn’t complain. He is fussy and on edge. The steroids contribute to this. It is unbearable and so intense at times. It is tolling. After many days the intensity subsides. It is becoming manageable. You feel some progress. You are waiting for cell counts to start. There are so many blood transfusions. The bone marrow was wiped out with the chemotherapy. The transplant is the donor stem cells that are responsible for replacing the lost bone marrow. We wait for these new cells to start replicating and producing new blood cells. There is much more to this than what I describe but it is an amazing process. This is a fantastically complex system of medical care. A mistake can be lethal. Progress can’t be measured so much as in days. It is seen in weeks. The subtle changes are hard to see each day. I cannot imagine how this is for a three year old child. A child is not meant to be confined to a hospital bed. There has to be some activity. We try to do as much as we can with books and activities but we are limited. Television and movies help to pass the time. He is sick. Not much helps. He is four on July 9th. The world has stopped around us. Our focus is on him. People outside are working. Families are on summer vacations having fun and making memories. People are out shopping. They go to the grocery store. They’re driving their cars. They are doing their lives. But we are suspended in time waiting. The minutes and hours pass so slowly. The days and weeks go by quickly. And we wait. There are routines each day. You start to notice things on the 5200 wing. You see activity at one of the rooms. Family members start to show up. And then it is over. The room is cleared, cleansed and sanitized. Within a couple of hours it is ready for the next one. There is a bulletin board that has a picture of each of the patients on the unit. There is now an empty space on the board. A new picture will fill it within days. Our neighbor Chris has left. There was nothing else they can do. He isn’t getting better. His mom left eight hours ago. She is by herself and would drive back home alone. Chris is too sick to travel by car. He is transported by plane in a hospital bed. His mom hopes he can make the trip home and not die in transit. Within days a little one is next door. She is under the age of two. She is adorable. Her name is Mollie. Katie is the same age as James. She is joy. She is sunshine. She is several weeks after transplant and she is having good success. She is walking the halls. She makes you smile just to get a glimpse of her. She’ll be outpatient soon. One morning I go to the lounge. Her mom is there and she is crying. Emotions are always on edge. Sometimes we cry for each other. We share our tears. But her tears are for Katie. It has come back. The beast has returned. There is little they can do. The options are limited. The choices are brutal treatments with little chance of success or go home and die in peace. They will leave for home within days. She will have the freedom to go home and die. She dies on James’ birthday July 9th. Her suffering ends. It hurts. There is a connection to the others on the unit. You suffer with them. You don’t have time to deal with it today. It is added to the pit in your stomach that gets deeper, wider and larger. There is a lot more in events and details from his transplant date of June 23 to the month in between of July 23rd. There was some progress in ways. His bruise on his arm from before entering the hospital is still there. His digestive tract is still raw. He has tried to eat ice and popsicles but it would not stay down. The doctors order a simple procedure. It is a procedure that is done all the time. All of what has occurred is monumental to any family. It is so much to take in and overcome. But our son is still here. We plan on his recovery. We don’t know what the long term future of his life is but we are not prepared for what is about to happen. How do you answer that? For a month he has been outside his room once. It was a bad experience. He has felt miserable. He is weak. He is vulnerable. Everything they have done to him has been bad. Radiation. High dose chemotherapy. A constant poking, and prodding and changing bandages and taking temperatures and taking readings and cleaning……The only bright spot was having ice and popsicles and this was taken away because it was hard on his system. “What are they going to do to me now?” When you have to look into eyes that trust you and hear his voice, it is more than words can tell. I did not have to hear this and see his eyes but it cuts to the heart. He is having trouble coming off the ventilator. This is somewhat unusual but the doctors are not too concerned. He has been through a lot. His body is weak. He has congestion. They will try later. What they found in the procedure were areas in his digestive tract that are so raw. Severe damage. Some areas in the worst category. As the day wears on we decide to have the kids spend the night at the caregivers house. I bring them clothes and such and head back to the hospital. They did attempt to take him off the ventilator in the afternoon and he still struggles. Something is wrong. No one knew. 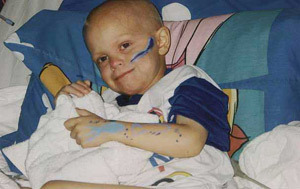 July 31st, 1996 on a Wednesday, James entered the hospital for the first time. A doctor visit that afternoon confirmed that something was wrong. The lump on his temple and the droopy eye is something. But blood tests send us to the emergency room that same evening. By Friday we hear the diagnosis of neuroblastoma. It is a cancer that causes tumors. He had several surgeries. His doctor orders an aggressive chemotherapy regiment. More time at the doctors and hospital than at home. Most holidays are spent at the hospital. After all this we make it to Duke for his first transplant. It was a mountain for us at the time. But going through it all and seeing his recovery, his hair growing back, his health and energy returning, clean check-ups, and eventually his central venous line removed from his chest….All of this helped to cancel the great debt of what he and our family endured. It helped to take it away. It was justified to remove the curse of cancer from his life and ours. He still had scars to remind us of it all. The scars are shocking to those who see them. The largest scar ran from one side of his belly to the other side. It was very seldom that I was aware of it anymore. To have him with us healthy, strong, and growing was a gift from God. Kids are amazing. There is a problem that no one can see. It is hidden. It is missed. There is such a battle to fight with recovering from all he has endured. But this would be too much. Despite all that he had been through, he had been so very strong. So very brave. Courageous. But not this. This would be too much. It would silence his lips. When the procedure was done, the areas that were tested were very raw. The worst areas continued to bleed. Heparin is used for his central venous line to prevent clotting in his line. It circulates throughout the body also. It keeps the slow bleed from stopping. The bleed is in the intestines and is not seen. A continual bleed. No one knew. No one could see. It was the six o’clock labs that would reveal it. The nurse found it when she tried to draw blood for his routine labs. She knew immediately. It is emergency. Critical. Severe. Turning point. Everything changed. Collapse. Impact. PICU. Pediatric Intensive Care Unit. This is so different than the quiet specialized, isolated wing of 5200. The climate here is intense. It is suspense. The doctors and nurses are distant and expressionless. They are disconnected. It is life and death business. But in a much different way. It is hard and unforgiving. There is not time for emotions because life is on the line. Procedures and treatments are done immediately. It is NOW! And our son is there unconscious and unaware of the battle for his life. We are on the outside. We have knowledge of what has happened. We can do nothing. Uncertainty. What happened? Shattered. It hurts. It aches. We love our son. We would take his place. We would bear his burden. We would suffer his pain. But we can do nothing. We are the protectors of our son and we cannot protect him. We cannot make it better. We can do nothing but ache. It is large and consuming. God have mercy on him. The loss of blood collected in his intestines. It was a lot. We were able to be by his side when he was stabilized. He had almost died. Everything comes at a cost and with a price. And then it happened. The blood that had collected was about to be released. It was large clots at first. But after that the liquid blood poured out. There is so much. It kept coming. The nurses lift the pad underneath him so it does not spill onto the floor. And we are there to see it. We are with him. He is heavily sedated and yet he opens his eyes and looks at me. This is traumatic on his little system. But it is necessary. It is essential to rid his body of old blood. I hate that I am here but I am grateful to be here. He needs us to be by his side. We are there for all the good parts of his life and we are there in his worst moments. What has happened? You do not realize the impact that your children have on you. When things are good you take for granted what you have. You do not realize it. If this is you then thank God! It is good that you have that care free, casual love that does not know pain and suffering of your son or daughter. It doesn’t mean that you don’t love them as deep as I describe. It’s that you haven’t been required to follow this path. You think that you love them deeply. You care for them greatly. But to experience something like this is so deep, so intimate, so profound. It takes you to a place that you do not know ever existed. It is impact. It is life altering. Waiting. We wait. We are allowed to wait at his side. He needs us to be by his side. We have witnessed the unthinkable. It is too much for me. His mother will stay by his side. She cannot leave. A mother will do that. God gives them something different. I escape PICU. I walk away from the hospital. I cannot believe what was just experienced. I can barely walk. I grab the rail as I walk. I am heavier than my legs can bare. I am weaker then my feet can carry. There is a phrase pounding in my head. I can hear it ringing in my ears. The shedding of blood! The shedding of blood! Christ Crucified! I saw Christ crucified in my four year old son. This isn’t a positive revelation of purpose. It was the hard, cruel reality of innocence sacrificed. Blood was shed with Christ crucified. Blood. Blood represent life. There is blood shed everyday somewhere in this world. It is a reality. But it’s quite different when you know someone. It’s quite different if you love them. It’s all the difference when it is your child. He didn’t deserve this. He did not choose this. Blood represents life and therefore it is precious when it is the blood of the one you love. It is priceless. The value immeasurable. How do you process this? How do you overcome this? What can you pray? There are no words for what is unspeakable. Mercy. That’s all. I can only pray for mercy. God have mercy on James. There are no other words to pray. Help. Maybe help I could pray but that’s not the same. Have you ever prayed for mercy for your child? Most would say ‘No’. Or most would say ‘Praise God, No!’ Your child breaks his leg you pray for healing. They get sick and you pray that they get better. But mercy? This same night, away from the hospital, my daughter is sleeping at the caregivers house in a bed she has never slept in. She has a dream. An angel meets with her. She says he is so bright. She cannot see his face only his back. God sends her an angel to comfort her. It is so real to her. So vivid. Acute renal failure. That’s part of the aftermath. When there is loss of blood to the extent that James experienced, organ systems shut down so that blood is directed to the vital areas especially the brain. His kidneys shut down. They no longer function. The kidneys are like the waste water treatment plant of the body. It filters the blood of toxins and waste by products. When the kidneys shut down the excess body fluids collect in the tissues of the body. This is not good. The tissues swell. It is disturbing to see. What has happened? How can he overcome this? The main battle that he was fighting was the aftermath of radiation and high dose chemotherapy. That was the battle that we, the doctors and nurses, and he were fighting. It wasn’t a battle that was being won but there had been progress. It wasn’t a battle that was being lost either. It was a fight that I believe could be overcome. But this is a second battle. Two battles for his life. He is amazing to make it through. He has been so very strong. Now add to it another surgery and kidney dialysis. How defeating. A catheter is placed in case his kidneys start to function. He has taken so many blows. He has taken so many hits. He has the strength to come through. But to wake up to this? It is defeating. It has silenced his lips. His eyes show that he understands. But he won’t speak. His look shows defeat. And betrayal. There is no way to explain to him what has happened. What has happened? We cannot take it in. We cannot process it. How can we expect him to understand. His mother stays by his side always. It comes at a cost and with a price. It hurts. It aches. It is too much to bear. It is too much to think about. The burden is too great. But your hero and champion lays shattered and broken. You will serve him each moment. Whatever it takes and whatever the cost. We will do this. We will fight for him. We will give him courage. We will be by his side to comfort and care for him. His mother is the best medicine for him. She soothes his pain. It is pain of the body but more pain of the heart. His heart is heavy. How can this be? As we comfort him he comforts us. Whatever we give to him he returns it back. Love is given and love is given back. What a great return of investment. Compassion is offered and compassion is offered back. This is love expressed. It is beyond words. His last month is one of waiting. We didn’t know it at the time. As I look back on this I see it now as maintenance more than anything. There is little improvement. There is little progress. We wait by his side. He needs us to be by his side. His kidney system is conquered. His other body systems would be defeated over the course of a month. Everything has changed. The battle of PICU changed everything. It is July 9th, 1995 and we are headed to the hospital. Terri’s water broke. She is in labor with our third child, James Matthew Greenleaf. We make one stop on the way. We stop to buy a camcorder. We did not have one at the time so we buy one today. We had planned for this but we had not planned for her to go into labor today. We would use this camcorder for the first time to record his first moments. We would have this to celebrate his first moments captured in time. It is August 23rd, 1999 and I am at our apartment with our kids. I am disturbed and anxious. I try and take my mind off what the doctor has told us. I decide to view some video that we took earlier this year of better times. This same camcorder that we purchased the day he was born does not function. It doesn’t work. After all these years I do not know the significance but it is significant. This same morning James’ doctor tells us that his labs are showing that he is dying. It is a certainty within the next several days. I won’t accept this. We didn’t know. He had progressed off the ventilator in PICU. He came back to his room in the 5200 wing. This was so important. In the last several days occupational therapists started working with him. What is occupational therapy? I hadn’t heard of this before. When I first heard it I thought it was for preparing people for jobs. It didn’t make sense. But no, it is for patients that spend so much time in bed that they lose function of arms, legs, hands, and feet. The muscles become weak. They need to be stretched and flexed and worked and massaged. Children don’t need this. They are out running, jumping, climbing, and playing. This is for the elderly or stroke victims. But our son needs occupational therapy. What has happened? The doctor met with us before noon and tells us this news. I go to make several calls. I don’t know what I said but I know I did not say that James is dying. I do not say that he is going to die. I have not accepted what has been said. I make the calls and I suggest that the doctor explained to us that the situation is bad. We should know something in the next 48 hours. It’s hard to speak. We do not know how to interpret what we see. The doctors are not sure what is happening either. It is not good either way. Some more tests will be done today to help determine what is happening. Very labored breathing and they will most likely start the Bi-pap(?) again to help support him. There is a battle that is happening inside him. Perhaps his intestines or lungs or kidneys? It is disheartening not knowing where it will lead. The few times that he opens his eyes the look is distant and far off. I am weak. I am deflated. Again I leave the hospital. I wander. I am headed somewhere. I get on the shuttle that takes you from the north part of the hospital to the south end. This is a large complex. All the emotion is too much. I can hardly stand. And the tears won’t stop. It is a wave of emotion too great to control. I am surrounded by many here on this busy tram and I am all alone. I cannot stop the tears. It is so deep. What words can I pray? I cannot pray. I cannot find the words. James’ mother stays by his side. He needs her to be by his side. It is evening and I have picked up Paul, Brittney, and Mikey. We go to the apartment. We do the routines. I put them to bed. I have been up since 6:30 am. I had restless sleep the night before in the hospital near James in his room. The night labs were disturbing to the on-call doctor. She wakes me at 2:00am to tell me he is so sick. I am not the one who hears the news first. It is different when you are the one who takes the news. The one I love takes the news first and then tells me. But tonight I hear it. She says not to call his mother until the 6:00am labs are drawn. At 6:30 she tells me the labs are better. I don’t realize that she is stalling. She is stalling so James’ doctor could meet with us and explain his condition. It is now 10:30 pm and the kids are asleep. The one I love will call me soon. I wait on the couch and drop off to sleep. I wake up suddenly at 11:00. I am wide awake. Nothing woke me but I am wide awake. The phone rings immediately. The nurse says it’s time. I don’t know what she said. She had to repeat herself several times because I could not hear what she is saying. But I understand 'The time has come'. August 1st, 1996 one day after James entered the hospital for the first time, the pediatric oncology doctor met with us with his diagnosis. He started talking and explaining what the tests and x-rays were showing. He explained his condition and his cancer and malignancy and tumors and I could not hear what he was saying. I just know that it was bad. His mouth was moving and words were coming out and my head was understanding ‘This is really bad’. Tonight the words were coming through the phone; the nurse is saying something but all my head is hearing is “It is time.” I knock on the door of the apartment next door. She is a sister in Christ. She will stay with our kids. Her husband is home and he stays with their two boys. Every one is asleep. This is the night that my son dies. It is there with me when I drive, as I park, as I walk, as I enter the hospital and see the many wandering the halls, riding the elevator, walking the winding hall to 5200 and entering the unit. Does anyone know that my son is dying? Can they see? This is the night that my child dies. No one prepares you for this. You just are there. What you see with your eyes seems so unreal. Surreal. It seems you are playing a part in a play. This is good. If you were to feel the full impact at that point in time it would be too much. There will be a time to process what you have seen. This is not the young boy I knew. What has happened? His body that once held life is maintaining. The breathing so mechanical. When you look on your child when they are resting you see just a slight quiet breath. They are resting peacefully. But what we see is much different. His breathing is mechanical and labored. It would be weeks later that we would know what they call this state of breathing and it describes it best……the death pant. That’s it. A labored panting in a lifeless body. His mother sits next to him and I see her changed. She is different. A month earlier to the day I was calling on God “Have mercy on my child! God, God have mercy!” But not now. No, tonight it is a whisper. A faint whisper. “God have mercy on us the father and mother. Have mercy on Paul and Brittney.” A resident doctor comes in. She starts speaking words. It’s bad enough to know he is dying and near death. But this is a younger resident doctor. She goes into details of why he is dying. She explains what is happening. As she continues I feel each word. Each word is pulling me down, further and further down. I feel my face dropping. The emotion of sadness and despair is translating to my face and body as I feel every part of me is sinking down. Couldn’t the doctor see that it is too much? Didn’t she know she should stop? But no, she continues. She goes on and on explaining all that is going wrong in our son’s body. It is like when you were young and the bully twists your arm behind your back and slowly twists harder and harder until you yell for mercy. But this is much worse because her words are the twisting and it is twisting my heart. She is twisting and twisting harder and harder my heart. I slowly turn my face more and more away from hers as the emotion of sadness and tears are welling up from deep within. Finally with my back turned and my heart screaming “Mercy!” I put up my hand and say “That’s enough.” I cannot take anymore. She leaves. We wait for James’ doctor. It’s the middle of the night and he will leave his family and make the trip in to be with us. He will be here. The one I love has changed. She has a calmness and strength that I so needed. We wait by James’ side. He needs us to be by his side. Earlier that evening I walked out with him. It was dusk. He was headed home. We talked of lighter things. He talked of his daughters. Casual conversation. His look tonight is grave and solemn. He didn’t have to say anything. We already know. He explained that James was being supported by several medications to keep him going. Medicine and technology can keep the body from dying. It is our decision of how long. We are alone to talk. I am lost. James’ mother is decisive. She had made the decision many months ago with James’ doctor in Charlotte. They had discussed it but not willingly. But she has looked over every detail of his life and makes the best choices possible. If this time would come then she will let him suffer no more. She will not stand for him to suffer anymore. If this is to be then she will not delay it. We bring in his doctor. I think he is relieved. I think he is relieved because when a child is in this condition, it is hard on the medical staff to watch a body kept alive. No one prepares you for this. You just are there. I will take one last wander away from the hospital. I ask the doctor if I have some time. I leave. I will meet with God. He is always there but I seek solace. Usually I would go to the chapel. It is a magnificent structure and a place I would go to often. But it is late. The doors are closed. I will find the gardens of Duke. Now I face my pain more intimately. It hurts. It is too much. My pain is for James and his mother. It is for Paul, Brittney, and even little Michael. But it is for all those who have been pulling for James and caring for him and praying for his recovery. There are so many who love him. How do you pray for this? It is quiet and still. Darkness surrounds me. I pray. Help. Strength. Courage. Comfort. Help. I pray for this and more but I have no words to pray. I do not know how to pray for what is happening and what is before us. I have no words to pray but a prayer is being lifted up. Needs are being lifted up. Unspoken words are being lifted up. And God listens. He responds. He hears what the heart is whispering. He knows and He meets with me. Romans 8:26 In the same way the Spirit helps us in our weakness. We do not know what we ought to pray for, but the Spirit himself intercedes for us with groans that words cannot express. The Scofeild Bible articulates this verse even more by saying “when Christians are so troubled as to find great difficulty in praying, the Holy Spirit is interceding for them with divine intensity that expresses their needs perfectly to God”. It is too much for me. I am not prepared for this. God have mercy. But God has prepared me for this. He gives mercy. He gives strength. He gives courage. He is all of this to me. He has provided for me. God has given what I lacked. I have been given a great gift in being able to meet with God in such a dark moment. And my God supplies for all my needs. It is past midnight. I am headed back to my son. It is decided that we should bring in Paul and Brittney to say goodbye. I go to the apartment. They are fast asleep. They sleep in the same room. I wake them from their sleep. I tell them it is time. Their brother is dying. There is such a pure innocence. A pure sweetness in them. There is little I can add to this. It is pure. It is intimate. It is something that most parents do not get to witness. This is good because to witness this innocence and purity will come at the death of their brother. Despite the circumstance, I am in awe of the beauty of their innocence and purity. The previous Saturday I was back in Charlotte to pick up the kids and bring them back to Durham. School was to start Monday. We would home school our kids while in Durham hoping we would be back home in a few months. While at our house I pick a bouquet of roses from our rose bushes. They are an afterthought really but to brighten our apartment in Durham. Brittney carries this bouquet of roses for her brother. They are to honor him in his lasts hours. We arrive at the hospital and park. As we get out Brittney breaks down. She can hardly walk. It is too much for her. It is overwhelming. Paul is like me. Sad and sensitive mixed with calmness best describes his composure. We stop several times to soothe her. We comfort her. She carries the bouquet. As we enter the room Brittney has calmed some with less tears. Paul walks around the hospital bed next to James. He sits. It hits. All the deep emotion that was building within him is too much and comes bursting out in a strong wave. He cannot control the tears and the release of the emotion is necessary. His mom holds him close and soothes him. Brittney and I are on the other side of James and now again her tears return. This time her tears are for Paul. She is sad that he hurts and that he cried. This lasts for just minutes and then again he returns to the sad sensitive calmness that he came in with. This same sensitive, kind calmness minus the sadness but add joy was seen in Paul the day James was born. He entered the room the day James was born with these qualities and now after saying goodbye he was leaving the room with these qualities. These qualities had changed from joy to this nights’ sadness. For Brittney I believe she is sad for everyone in the room: for James, her mom, her dad, for Paul and possibly even for Michael. In a sad way these are treasured moments when you are proud to see your children sweetly and compassionately say goodbye to their little brother who had become such a big part of their lives. It is a glimpse of innocence and purity like none other. James has been asleep through all of this. He has been like this all day. We do not know if he is aware of what is taking place. I believe he is waiting to be freed from this body of suffering. How have we come to this? Brittney and Paul leave. They are in a room nearby. They wait. Freedom! Mostly symbolic as we, along with the nurses begin the freeing process of disconnecting all the life support that keeps James from dying. We remove the mask on his face that assists his breathing. The lead wires that measure heart rate and oxygen are removed. This is good. We will not hear that last heart beat. They disconnect the IV to his central venous line. They remove the catheter that drains his nonfunctioning bladder. The dialysis is disconnected and the machine taken from the room. A rocking chair is brought in next to the hospital bed. We lift his limp body carefully from the bed and his mother holds him. She holds her son in her arms. Face to face. She sits and begins rocking him. We are there with him. He needs us to be with him. We need to be by his side. We are alone now. And we wait. Sorrowful despair, painful heartache, and deep felt sobs best describe the mother of James. But words are being spoken to James. They come from deep within a mother’s heart. They are beautiful words. An endless stream of lovely words were spoken tenderly to her son. It is intimacy like none other. I am without words. I am lost. These last hours are haunting. The visions grab you and tear you. It reaches to the core. It is too much. It is agonizing. There is a last breath and the mother knows. We wait. I call the nurse. She is tender and delicate. She is compassion. She listens to his heart. She whispers “His heart is quiet.” It is over. A young heart is quiet. It beats no more. Breath of life is no longer. His eyes we will not see. His precious hands and feet will no longer run and play. He is still. There is peace. The doctor returns and is required to ask two questions. The mother still holds her son. “Do we want an autopsy?” No. And “What funeral home?”…..What funeral home is the question and there is no register. This was not part of the plan. I am sure the doctor is amazed and dumbfounded at us. There were no guarantees going into transplant. I believed that James would make it through transplant. After that I didn’t know. What funeral home? You don’t ask this question to parents of their child. This is not appropriate. This question is more appropriate to the elderly. But yet the unthinkable has happened. We will have an answer the next morning. We know of no funeral homes today. My eyes see a mother changed. We lay his body on the hospital bed. His little body has been through too much. We have asked too much. We look on him again and we are so lost. His mother and the nurse wrap him in the hospital blanket. Weeks later I realize how appropriate. Four years prior to this James was born. The nurses wrapped him in a blanket the day he was born and now we do the same without any plan or purpose. The nurse and chaplain want to take him but we choose for me to carry him as far as they allow. I hold my son for the last time. I look on him as I walk. He is heavy in my arms. We walk the hall of 5200. We pass through the double set of doors. Down the long hall away from 5200. Around the curving hallway to the elevators. This is as far as they allow. I hand him to the nurse. I am alone. No one prepares you for this moment. You just are there and then you are lost. We will not walk out of Duke University Medical Center with James. We are empty and lost. Paul and Brittney are at our sides and we carry each other. What has happened? “Precious Lord, take my hand, lead me on, help me stand, I am tired, I am weak, I am worn; Thro’ the storm, thro’ the night, lead me on to the light; Take my hand, precious Lord, lead me home. I take them back to the apartment and return to the hospital. It is still the dark of morning. The nurses and I pack the room. We have been here three months. The cards, banners, pictures, and posters cover the walls. The room is emptied quickly. We have been here three months and we clear the room within hours. By late morning it will be ready for another and there is now an empty space on the bulletin board of pictures. James has finished his fighting. We saw the signs on Sunday, but ignored them thinking he would recover. He told us by the distant look and the closing of his eyes when we spoke to him. He was saying, “I have had enough”. His stats and lab work did not show these signs until yesterday. His breathing, liver and other physical symptoms started to show the hard facts that his body was giving out. Later in the evening, the doctor explained to us that James was ready to let go. We spent several hours with James before freeing him of all his connections. About 1:00 AM, we brought his older brother and sister in to say goodbye. They then went to an extra room on the unit that was only used during the day. Brittney presented roses to James that I had cut on Saturday from our house in Matthews. I had no idea that they would be used to honor James in his last hours. Last of all, we disconnected his breathing assistance - we did not allow a ventilator because of the stress it would cause on his body. Finally free, he spent his remaining time in his mother’s arms. Through deep felt sobs, I heard beautiful words spoken to James from deep within Terri’s heart. Words like “James, you have been the bravest boy”, and “You have fought so hard”, “We are so proud of you”, “I love you so much” and also words of letting go. We saw only peace in his face and body. I know the many prayers that have been prayed on James’ behalf were for healing. They were not needless. God wanted James more with Him. Now he has no cancer, no suffering, no connections to I.V. pumps and other hookups. He is free. He is at rest and in peace with our Heavenly Father. Time has stopped. Broken and shattered. Lost and heavy. The drive from Durham to home is endless. I have not slept. This is the longest day of my life. It aches. I ache for everyone. I hurt for everyone. It’s not just my loss. It is my wife’s loss, the one I love. It is my sons and daughters’ loss. But it is also for family and friends. It is our church’s loss, who has been the hand of God. It is our new found friends in Durham. It’s our neighbors at our home. It’s Paul and Brittney’s’ school. These young ones are coming to school on the second day of school. They have prayed for James. They have known him since his first fight with cancer. They will hear that he has died this morning. They will meet at the flag pole and share a moment in silence to honor him and then pray. There is a vast network of saints who have been cheering and praying for James. I have felt their prayers. I have read their words of encouragement in cards and webpage guestbook entries. I hurt for everyone. It is a deep ache of the heart. You do not have time to process it. It is too overwhelming, too great to deal with. What has happened? We are home and we enter our home with a loss. Our family is now broken. It will not be complete in this life. We want to be alone. We want it to go away. There is a knock at the door. As I open the door I am so humbled by what I see before me. It is her friends. Her group of godly women who have been with her since before James. There is tenderness and compassion. They lift the spirit. They bring light to darkness. They carry comfort and care in their hearts. It is beyond words. They come to meet with the one I love but just their presence is medicine to me. It reaches every part. They consume the mother of James. Their tears are shared with each other. The pain is poured out to each other. It is intimate. I am not part of this but my heart is lifted knowing the one I love is cared for. She is wrapped in love. The fingertips of God Almighty are reaching to the mother of James and touching her. Her friends are the fingertips of God and I am so grateful. It is beyond words. The fingertips give touch. But the fingertips take information. They respond to what they feel and relay the information to the brain. These ladies are the fingertips of God that touch with care and compassion but they will also carry back to the hand of God what they have felt. The hand of God is the church and the church will lift up the information to God. The message from the fingertips is carried to the church and lifted up to God Almighty. We are exhausted. I don’t remember what we do. I do know we have an appointment in the morning with a funeral home and cemetery. We are lost but God brings us people who give us direction. We know not of any funeral homes or cemeteries. But the people of God know and provide for what we lack. We collapse to bed after 10pm. It has been the longest day of our lives. As we enter the room she cannot stand. She sobs and weeps and groans. A decision is made. A white casket for purity and innocence. It is child size. We are carried across the street to the cemetery. I have not seen anything like this. It is beautiful. I know we are here for what we are here for. But this is unexpected. The ones that carried us here have a connection to this place. Their loved ones are buried here. It has value to them. It is a place they can come to honor and remember the ones that they love. I am so humbled to be here. Plans have been made. Plans are set. The hand of God, our church, Christian friends and family will meet the many needs we have. They carry us through. Two fingertips of God go and chose his clothes. His name is embroidered on his collar. The fingertips choose pure white. How do you choose a final outfit? How do you make that choice? It is chosen with love and care. It is the finest choice. Somehow we make it to Friday. A private viewing is this evening. A service is tomorrow. It is morning and we head to the funeral home. James’ body is prepared. We have not seen him since Tuesday morning. He is still. He is at rest. There is peace in his face. There is beauty in this moment despite where we are and what has happened. I cannot understand this. I cannot grasp it. No one prepares you for this moment you just are there. It is agony. It is wrenching. It is pain. But somehow there is a beauty in his peace. The suffering is over. His pain released. The struggle finished. We cannot stay and we cannot go. There are flowers that surround us. They honor James. Some of the arrangements carry a distinctive scent. It will place me here in the future. Even today when I catch the scent it brings me back to this moment. As soon as I smell it I hate it. It is offensive to me even though the scent is pleasant. It is hard to express because these feelings that I have I am not accustomed to. It is not my personality or nature. But it is real. It is hate and anger mixed. Rage? Rage seems strong but under the surface there are times when there are feelings that are triggered of hate and rage for what has happened. These feelings are directed at what? It is not at God. He is the maker of James. Yes, He could have healed James and we pleaded for it, but God’s Word and the books of wisdom speak of the plans of God are beyond us to understand. Job was taught this. It’s more that we were incapable of saving him from all the suffering he endured. Frustration. Rage might be too strong of a word to describe these feeling at times because I can choose to engage with these feelings. I can control it. But these feelings are there just below the surface and certain things like the simple scent of a flower can bring them to the surface. It’s not against God or the doctors or the nurses or hospitals. But it is more against the bully and beast of cancer. It is against the medical technology that took him to a state that is not natural and took the life so slowly from my son. The beast was a bully with each hit and blow my son received. And I could do nothing against it. It stepped on me and taunted me. And now I am by the side of my son who lies in a white casket dressed in a pure white outfit with his collar embroidered with James and surrounded by flowers that give a distinctive scent. The feelings are justified and right. I do not have time to deal with what is before me. It is too much. It is too consuming. Tonight is the viewing and family is in town. Tomorrow is the service to honor his little life that is huge. I am numb. We are numb. People are so amazing to us. There is a purity and sweetness like none other. It is soothing. We are carried. It is Saturday morning. I am heavy. We carry each other as a family. We come to the back room of the church. We will be escorted in. I am humbled to be here. This is bigger than anything I know. I am small. It is humbling to know that the sanctuary is being filled by so many. There are his doctor, and nurses. Most are from his hospital here in Charlotte. A few of his nurses from Duke. Our family has traveled from other states. They have come a long way. And the family of God. There are so many. I know what they have done. Their deeds are endless. They have made meals for us. They watched over Paul, Brittney and Michael. They prayed so intently. They gave financially and continue to give. Their kids are my kid’s age. Their sons and daughters go to school with Paul and Brittney. Their children are in preschool with Michael. Some have children the same age as James. Some do not attend because of this. It is too difficult. But some do while their four year old child stays home. Some bring their older sons and daughters. It is overwhelming the outpouring of love showered on us. It is too much. We are exposed and so vulnerable. I am so small. breeze. His fair complexion and hair give a radiance in the glow of the sun. and others came to his support. the blessing right back to those who gave their love and support. front line of battle. We are so thankful for their delicate care. bringing him into the loving hands of God. We Love You James Matthew Greenleaf! We enter the sanctuary and there before us is the white casket closed and draped with cascading white roses. James is here. His body lies inside. There are so many fingertips of God that surround us. The hand of God carries us. We head to the cemetery. It is mid day. It is warm. We are surrounded by God’s beauty. Each of us carries a white rose. Words have already been spoken at the service at church. The twenty third Psalm is read. soul: He leadeth me in the path’s of righteousness for his name’s sake. no evil: for thou art with me; thy rod and thy staff they comfort me. Before each of us places their white rose on his casket, I request that they remove the plastic water vial at the base of the rose. I remember James and all his connections to life support. This request would represent his freedom from his connections. I don’t know why this is important but it is. As everyone places their rose on his casket only one voice speaks quietly as she places her rose. "Thank you Jesus for this little piece of heaven." We will stay as everyone leaves. We are alone. We cannot stay and we cannot go. We want to look on him one last time but we cannot. We will not. We need to be by his side. He needs us to be by his side. We have been by his side for so long, caring for him. But no, he is not here. His body is lifeless and he has begun anew in a place we cannot go. Heaven. By Monday the family has left. The second week of school starts. People go to work. Life has not stopped and the world continues on not aware that James has lived or died. This happens everyday. It is a reality. People live and people die. Everything changed. We are the same but different. We have changed. The impact of James’ life on ours will forever change us. Impact. The weak need God. We are weak. And the hand of God reaches out to us and helps to carry us. We are carried. And God’s fingertips reach out and touch us. And the fingertips carry the message to the hand of God and God responds. We are comforted. Our loss is great. The pain overwhelming and consuming. But God supplies. He comforts. He sends support and help. And we are richly blessed despite the curse of cancer and the loss we have endured. We are valuable to God. We are valuable to the strong. They learn how to be Jesus Christ to us. God uses us to teach them about the weak and suffering. Suffering is a great teacher. Jesus Christ was a “man of sorrows and acquainted with grief”. And we are people of sorrow and acquainted with grief. And then God gave me a pen. It helps to express. The following writings came after James died. God helped me in my pain and mourning to help release thoughts that knotted the mind. Many of my writings were inspired and written in one sitting. I see them as inspired writings. Thoughts would accumulate into a large mass and would have to be released. And then words would flow unto the paper. I would say that the strongest writing I have done that is an example of this would be ‘Were you there, did you see’. Some writings came to me as wanting to express my thought on a topic. It formed in my mind and heart and then developed. The writing ‘To the Sufferers’ is an example of this. I included many writings because they each express different emotion and thought. ‘Venting’ is a writing that is strong and cutting but expresses controlled anger against words that were said that was like throwing salt on a wound. A wounded heart. And the pen helps to express. Paul, I grieve with you and your family as I read of your loss. Such a hard path. SO many things we don't understand about suffering but I believe seeing our child suffer is the hardest. Thank you for picking up the pen and sharing your heart. May God use your wound to reach others with comfort.